Here is one thinker who’s on the right track – we hope he and his colleagues will take this argument to its logical conclusion. Even secular Zionism has been a catastrophe for the Jewish people, but religious Zionism, combining two opposites into an unstable mixture, is leading the Jewish people to moral depravity. It is the complete inverse of the Jewish mission to be a light to the nations and bring peace to the world. 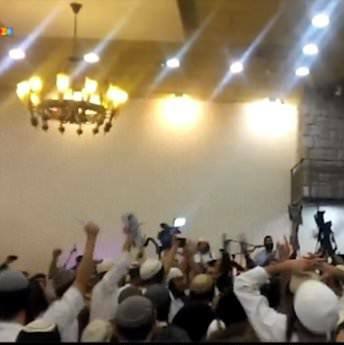 The thugs filmed celebrating the murder of a Palestinian toddler embrace ideas that are the logical extension of the combustible mix of religion and Zionism. Religious Zionists with a conscience viewing their racist wedding baby-stabbing video selfie are not happy. But condemning these thugs won’t do the trick, as it lets us all off the hook. The problem is much more widespread. This summer I asked an academic leader of a religious Zionist women’s post-high school seminary with a progressive reputation (the women study Talmud! ), “Are your students racist?” His immediate reply: “Like every single Israeli.” And this regarding women who do national service, and will go to university. And they all certainly did well on their citizenship matriculation examination, which contains a major section on equal rights and racism. I get similar answers in talking to students and teachers at other institutions. We religious Zionists are in deep trouble. There is a genealogy to the current hatred and thuggery - and even a marriage. Those benighted students, the happy fanatical dancers and not to mention the alleged perpetrators of the Palestinian family burning, were taught directly or indirectly by charismatic rabbis such as Dov Lior and Yitzhak Ginzburg, who also spawned Torat HaMelekh – a tract that encourages murderous violence against Arabs. Lior was a student of Chief Rabbi Avrum Shapira, the father of the settler movement subsequent to his older colleague Rabbi Tzvi Yehudah Kook of the Mercaz HaRav Yeshiva. All of these rabbis derive their standing from the ultimate authority, that held by Rabbi Avraham Yitzhak HaCohen Kook, a remarkable thinker who believed in a true universalism alongside a mythology of the Jew united with the holy land in a messianic return. The son, Rav Tzvi Yehudah, ratcheted it up, defining the Jewish ‘return to the land’ as irreversible, dropping universalism, while cautioning about unnecessarily stirring up the Arab population. Shapira, adding halakhic rigor, saw the Arabs as already stirred up; his only restraint was not to divide Israel’s Jewish population. His student Lior and others (Ginzburg is a Chabadnik whose bloody tract in praise of Baruch Goldstein, a mass murderer, has never been repudiated by Chabad) have decided that the Jewish people are already divided, and even moderate religious Zionists are a lost cause, and they accelerate past any hindrance to their (im)moral system and actions. The contemporary group, epitomized by the ‘blood wedding’ celebrants, are a marriage of a fundamentalist Orthodoxy uneducated in Western thought (they see it as the enemy) with modern Zionism. Zionism has given them the notions of urgent nationhood, the importance of power, and the need for idealistic fulfilment in the here and now. This is a combustible mix. Zionism alone can result in practical statesmanship even on the right. Witness Menachem Begin at his best. Orthodoxy without Zionism, irritating in its social strictures, limits its messianism to their blessing-bestowing rabbis, and limit their contact with the Other to mundane specificities such as how the Shabbes goy will turn the lights on. But putting Religion and Zionism together means we have created an Impatient Messianism. Its adherents are happy dancers to an irresistible trance tune, not hearing anyone else. They are frustrated by the Arabs (and their “traitorous” Jewish supporters) whose monotheism they dismiss. All Arabs are all the same, as they stand in the way to redemption – a parallel to the Anti-Christ in Christianity. They need to be bulldozed over. These “Krazy Kookniks” are now the cutting edge or logical extension of normative Religious Zionism, which today is overtly messianic, narrowly nationalistic, and in its Orthodoxy, essentially isolationist. Witness the understandably desperate demonstrations demanding more security at settlement junctions targeted by knife and car ramming attacks organized by local Jewish women. There were no Palestinian women also demonstrating for safety, for there never was a real outreach even in “better days” to that population. Even secular Israelis were not there, for after all they are prohibited from living in those self-ghettoizing community. The religious Zionist magic moment in Shabbat services is the prayer for the State of Israel – edging out the attention once given to the iconic Jewish prayer, the Shema – which describes Israel as “the first flowering of our deliverance.” Rather than hope, religious Zionism threatens to become, in the souls and actions of its adherents, a dangerous dogma of a deaf and dumb Impatient Messianism that talks to no one but knows just “what to do” to those who stand in its way, Arab or Jew. Rabbi Daniel Landes is Director of the Pardes Institute of Jewish Studies in Jerusalem, where he teaches the Senior Kollel Talmud class and Theology. The views expressed here are his own.